Hotel Portmeirion01766 770000work HotelThe Hotel Portmeirion opened in 1926 as the focal point of Clough Williams-Ellis' proposed idea village. Artists, writers and Albanian royalty have stayed - everyone is special at Portmeirion and all are welcome. The main building of the hotel was built around 1850 (extended by Clough Williams-Ellis in 1926 & 1930; listed Grade II 1971) was the original mansion of Aber Iâ.and first described by Richard Richards in 1861 as "one of the most picturesque of all the summer residences to be found on the sea-coast of Wales." The Hotel Portmeirion opened in 1926 as the focal point of Clough Williams-Ellis' proposed idea village. Artists, writers and Albanian royalty have stayed - everyone is special at Portmeirion and all are welcome. Hotel rooms and suites are located in both the main building of the hotel and in various locations around the beautiful surroundings of Portmeirion Italiante Village. Portmeirion is situated two miles south of Porthmadog on the A497. By Rail: The Cambrian Coast line runs from Pwllheli to Machynlleth with a station at Minffordd. There are trains to and from Machynlleth from Shrewsbury and Birmingham. If you are staying at Portmeirion please call on 01766 770000 to arrange a courtesy car to meet you from Minffordd station. Virgin Trains have an express service from London Euston stopping at Llandudno Junction or Bangor, either of which are convenient for onward travel to Portmeirion. From Llandudno Junction you can connet with trains to Blaenau Ffestiniog along the Conwy Valley line. If you are staying at Portmeirion contact Portmeirion on 01766 770000 to arrange to have a taxi to meet you at Blaenau Ffestiniog (charges apply). You can change at Blaenau Ffestiniog for the Ffestiniog Railway, a narrow guage steam railway that travels to Porthmadog, with a station at Minffordd (the station is 1 1/2 miles from Portmeirion). By Bus: There is a daily bus service from Porthmadog which runs from March to October. By Helicopter; Portmeirion have a heliport at GRID REF SH59283764. 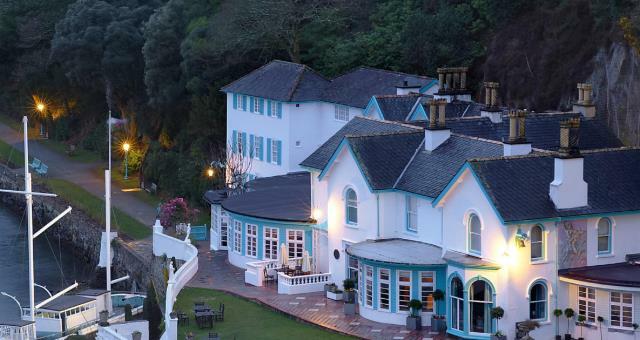 Advance notice is required of any planned landings.There is a £50.00 + VAT landing fee for patrons of The Hotel Portmeirion and Castell Deudraeth. For other users there is a landing charge of £250 + VAT.